Google’s plan to buy Motorola Mobility will likely win approval from the Department of Justice, just as Oracle earlier received approval to buy Sun. The acquisition will double Google’s workforce and increase the size of its patent portfolio to more than 17,000 patents. What should it do with all those patents? Google is not an active patent plaintiff, but at the same time, Google has never before owned this kind of patent portfolio. 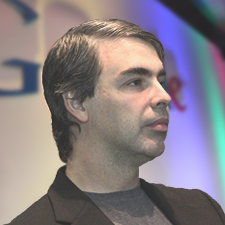 Larry Page wrote in a blog post that Motorola will continue to be run as a separate business. He also stated that the acquisition of Motorola will increase competition by strengthening Google’s patent portfolio. Well, surely Larry realizes these statements are to some degree incompatible. At a minimum, the Motorola patents help Google defend its Android investment against Apple, Nokia, Microsoft and others. But Google needs more than defensive thinking to manage the Motorola patent portfolio. Google must put the property to “its best and highest use”, as real estate people say. This means using patents offensively, depending on Google’s needs. Google needs a patent strategy that people at Google and Motorola can understand and execute. The plan needs a degree of simplicity for successful implementation. Using a triangle as a model, Google can create a roadmap to guide internal decisions about how and when to use its newly acquired patent portfolio. 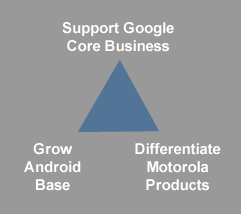 To implement the strategy, each patent in the Motorola portfolio should be assigned to one corner of the triangle. Patents might later move around depending on licensing, but this model establishes the initial priorities. The first priority should go to patents that support Google’s core business. That means any Motorola patents related to search and advertising go to the top. Such patents apply towards protecting Google’s major revenue source, which is advertising. Patents in this area would not be directly shared in support of the Android community. Rather, they would used to maintain Google’s advertising revenue stream, whether that revenue stream is derived from Android devices or not. Google would use these patents offensively to protect its core business. The second priority is to apply Motorola patents to protect and grow Android-based products. Some might argue that this helps Motorola’s competitors. More objectively, a broadly supported Android platform creates momentum and competitive excellence for Motorola as well as for other Android manufacturers. Solid platform support for the Android community increases hardware and software interoperability, and reduces the overall cost of Android as a solution. It also helps Android compete against Apple and Microsoft, providing more lift for Motorola. History provides a guide here. The PCI bus created by Intel allowed the PC industry to achieve a high level of hardware and software compatibility. Because of that standard, all PC vendors could pass lower costs and better quality to consumers. The resulting greater volume provided an incentive for the industry to innovate much faster. The same idea applies to using Motorola patents to grow and improve the market for Android devices. Google would use these patents defensively, a purpose acceptable to Android partners and developers. The third corner of the triangle contains patents that provide unique product differentiation for Motorola. There are many areas where Motorola can enjoy a competitive advantage. Likewise, all major Android device makers, including Samsung, HTC, and Huawei, have created patent portfolios in support of their devices and business objectives. Having patents to support Android-based products is an absolute business necessity for these vendors. These manufacturers took to heart what former Sun CEO Scott McNealy once said, that open source is “free, like a puppy is free”. If the patent litigation history of these vendors is any example, Motorola will cautiously use such patents both offensively and defensively. Motorola should have no problem preserving and even enhancing its product differentiation using some, instead of all, of the 17,000 patents in the portfolio.